To view and download the PDF summary, click here. Public/Private Urban Mobility Data Sharing: Evaluating Security and Privacy Solutions (November 13, 2014). In these previous workshops it was identified that all socio-demographic groups, including low-income and otherwise disadvantaged communities, must be accounted for in developing smarter, safer and more efficient cities. This workshop was designed to address how innovation and transportation development can be framed and adjusted to be more inclusive of all people in an urban environment. Gerry Tierney began Workshop #4 by defining the core of this workshop—namely, that we must not develop innovations and plan transportation networks for “winners and losers;” rather, we should plan for a new, inclusive mobility environment for all communities and socio-demographic groups. Professor Susan Shaheen then provided the context of the workshop in relation to the evolution of the previous events. She highlighted that the digital and income divide is becoming increasingly prevalent as the smartphone and other technologies permeate into our transportation networks, and we must remember that the public good must come first so that social and environmental goals remain the framework for present and future urban mobility systems. Tilly Chang, Executive Director of the San Francisco County Transportation Authority (SFCTA) began by offering a public agency perspective on accessibility issues. SFCTA is the transportation authority responsible for long-range transportation planning for San Francisco. Chang noted that the Bay Area has immense challenges related to income inequality, and it’s important that we don’t exacerbate them with innovative mobility options. Chang acknowledged existing challenges of San Francisco’s transportation system, including crowding and unreliability of the public transit system, safety issues associated with bicycle and pedestrian networks, and the economic and environmental impacts of vehicle congestion, as well as the opportunity for new services to address some of these challenges. She also pointed to the many other travel markets with unmet needs, especially in low-income, minority areas slated for growth. Chang questioned what the role of private services could be in offering mobility solutions. Chang referenced a 2011 Brookings Study by Martens and Bastiaanssen that proposed a measure of “accessibility poverty” which measures regional access to jobs within a transit travel time radius. As applied to San Francisco, the measure identifies accessibility poverty primarily in the City’s western and southern census tracts. Information and Access – Low-income ridesourcing (i.e., Lyft, Uber, Sidecar, etc.) users are greatly under-represented in SF. Chang outlined several areas where collaboration between the public and private sector is needed, including how best to serve low-density neighborhoods and other key markets such as paratransit, after school and late night/early morning trips. Akom also argued that many innovative mobility services are not being implemented within disadvantaged communities: “Where the ghetto and barrio end is where bikesharing and carsharing begin.” Expanding the geographic scope of these systems is important, along with understanding how to develop culturally- and community-responsive technology. He noted that it is critical to pinpoint what socio-demographic groups are “being left behind” and to understand why. The Streetwize platform gives planners that capability. Akom closed by explaining that we now have the tools to plan and design systems for the 100% rather than just the 1%. Following Akom’s presentation, Vien Truong, Director of the Greenlining Institute, described the policies and other measures that her organization has helped to advance and implement in California. Truong began her presentation by pointing out that twice as many people die from traffic pollution than traffic accidents and those in poorer communities are disproportionately affected. This was the impetus behind Greenlining’s work on the Charge Ahead California (AB 1275) campaign, which was designed to accelerate the application of electric vehicles (EVs) into equity programs in the bill. Finally, Truong explained that Charge Ahead California has gained traction among other states that are looking to replicate the program, and we can expect similar bills to be passed outside of California in the coming years. Hutchinson finished his presentation by reminding the audience that all of these innovative mobility services are using public rights-of-way to do business, and each service should be working toward advancing the public good and be regulated as such. Q: How can on-demand ridesourcing services (e.g., Lyft, Uber, Sidecar, etc.) connect with individuals in communities that aren’t well served by other transportation options? A: One suggestion was to develop multi-lingual app interfaces, especially in Mandarin and Spanish, and potentially offer subsidized rates for individuals who qualify. Using Streetwize may be an effective means of actually asking this question. Q: What sort of funding exists for mobility solutions that focus on addressing social equity issues? A: Apart from Charge Ahead California and cap-and-trade funds, there are not many funding opportunities that are available for long durations of time. One opportunity would be to raise the state or federal gas tax, but at present that seems unlikely. Alternative partnerships between private and public sector entities might be the most realistic means of implementing services designed to address social equity issues. Q: Is there a definition upon which everyone agrees of “accessibility”? A: There are several components to accessibility: temporal, geographic, and cultural. Definitions of accessibility are value-based judgements typically made by public agencies, and they can vary considerably among different entities. Q: What will it take for innovative mobility services to be expanded into disadvantaged communities? A: A critical component is funding. To obtain that funding, however, public agencies offering the funding have to understand/believe that a system is going to work if it is expanded into a disadvantaged community. For that reason, additional research is needed to ascertain ways that shared-use mobility and other services can better connect with communities that they have not connected traditionally with in the past. The workshop closed with a recap from Professor Shaheen and an outline of next steps. As data become more accessible through platforms, like Streetwize, and policies support the growth of sustainable transportation systems, like Charge Ahead California, there is clear progress being made. When discussing solutions to accessibility, we must remember that there is no silver bullet, and we must look at an array of tools and options to address this issue. It was identified from the presentations and follow-up discussion that there needs to be a better understanding of what underserved communities both want and need. To date, outreach has been relatively limited, being based primarily on public workshops or response to flyers. It was recognized that this is reaching only a limited or self-selecting segment of the community. How do we reach a larger more meaningful segment of the community? Also, how do we best take a more holistic view of the needs of the community? Do communities need mobility options in response to the lack of certain retail, work, or education options in or nearby their community? Does a disadvantaged community have relatively high private auto usage because there are no stores in that community, and if those stores were present what would be the impact on the mobility modes used? Based upon some of the questions asked above, it is expected that there will be a follow-up workshop or symposiums related to the topic of accessibility and the input of disadvantaged communities. For more information, email Matt Christensen of UC Berkeley’s TSRC at: mattchristensen@berkeley.edu. 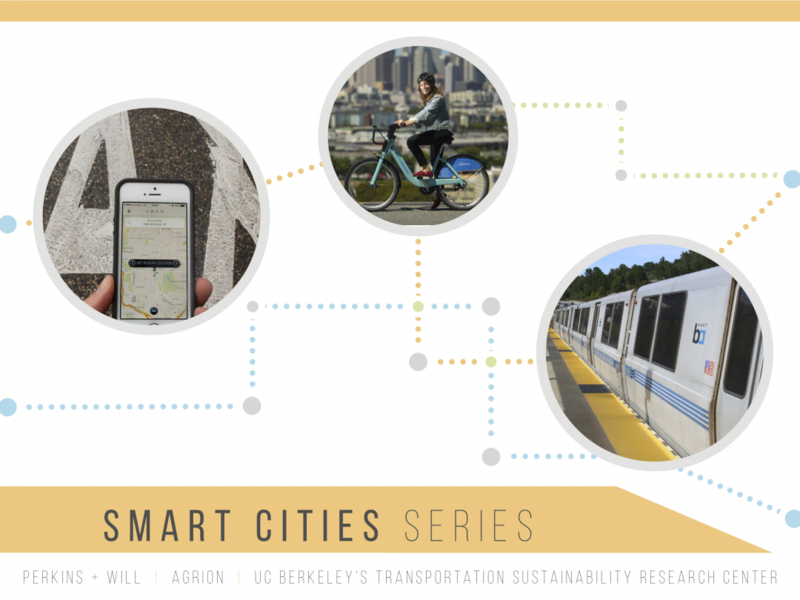 For other Smart Cities Series workshop summaries, click here.